Amazon Silk is a revolutionary, cloud-accelerated browser that uses a "split browser" architecture to leverage the computing speed and power of the Amazon Web Services cloud. Supports Adobe¨ Flash¨ Player. All-new sleek design sports an 11% smaller body, with the same 6" screen size, and is 8% lighter, only 7.5 ounces. 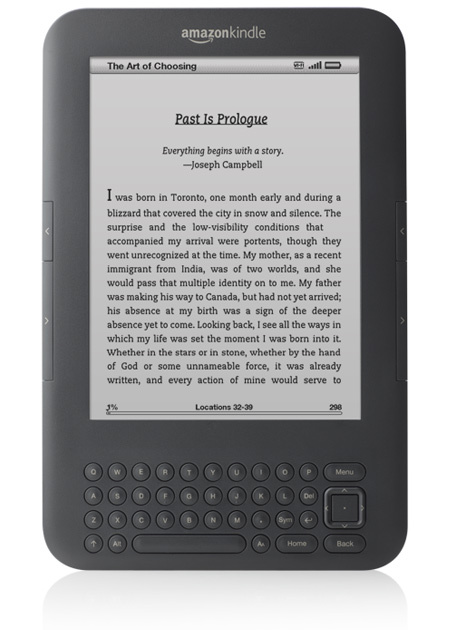 Kindle's high contrast, most advanced E Ink touchscreen reads like real paper, with no glare. Read as easily in bright sunlight as in your living room. Email personal documents and PDFs direct to your Kindle to read and annotate on-the-go. Massive Selection Over 1 million books, newspapers, and magazines, including latest bestsellers, Kindle exclusives, Audible audiobooks and more. Less than 6 ounces. Lighter than a paperback, fits in your pocket. Holds 1,400 Books. Kindle's high-contrast E Ink display delivers clear, crisp text and images. Read in Bright Sunlight. One Month Battery Life. Find a book and start reading in seconds with our fast, free wireless delivery. Connect to Wi-Fi hotspots at home or on the road. Includes free Wi-Fi access at AT&T hotspots across the U.S. Kindle is ready to use right out of the box - no setup, no software to install, no computer required to download content. Read comfortably with eight different sizes and three font styles. 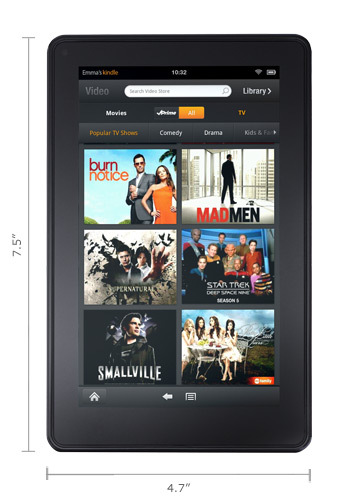 Kindle's powerful processor is tuned for fast, seamless page turns. Email personal documents and PDFs direct to your Kindle to read and annotate on-the-go. Over 1 million books, newspapers, and magazines, including latest bestsellers, Kindle exclusives, and more. Over 800,000 books are $9.99 or less. Millions of free, out-of-copyright, pre-1923 titles such as Pride and Prejudice are available. Download and read first chapters for free before you decide to buy. Borrow Kindle books from your public library and start reading on your Kindle. Free Cloud Backup. Kindle books can be read on your Kindle, iPhone, iPad, Android devices, BlackBerry, Windows Phone 7, Mac, PC, or web browser with our free Kindle Reading Apps. Our Whispersync technology synchronizes your last page read, bookmarks and annotations across your devices so you can always pick up where you left off. Add the Amazon Apps to your Kindle to get easy access to millions of products and the Kindle App to read your favorite books.